I was out for a walk with my friend Vicky, enjoying a beautiful day along the waterfront, when I spotted a pair of Mute Swans, (Cygnus Olor), acting in a way I’d never seen before. This odd behaviour, (described in the paragraph below) continued for about 15 minutes, and Vicky and I couldn’t look away. As we watched the intricate movements, of what we guessed was some sort of mating behaviour, I knew I wanted to know more. I took dozens of photos and went home to begin my research. While we were right about the movements being connected to mating, we had only scratched the surface of the story. It turns out that each pair of Mute Swans has its own courting ritual that they specifically develop to maintain a unique bond with their partner. The ritual is an intense courtship dance that occurs every time before they mate, which can last for over an hour. Though I cannot do it justice, I’ll try to describe the ritual Vicky and I witnessed. First, the two swans greeted each other by lowering their bodies and keeping their wings flat. Shortly thereafter they started dipping their heads in the water and then preening themselves. This action lasted for several minutes and progressively got faster and faster. Eventually the two made eye contact. The up and down motion of their necks, from their preening, became synchronized, and they looked at each other more frequently but only with sideways glances. Now the really fun part- and the one many of you have probably seen on Valentine’s day cards or online: the swans’ necks intertwine in a variety of patterns. Sometimes they formed a heart and sometimes a pattern more complicated and too difficult to describe. The movement, which was followed by them draping their necks over their partner’s body, was absolutely stunning. 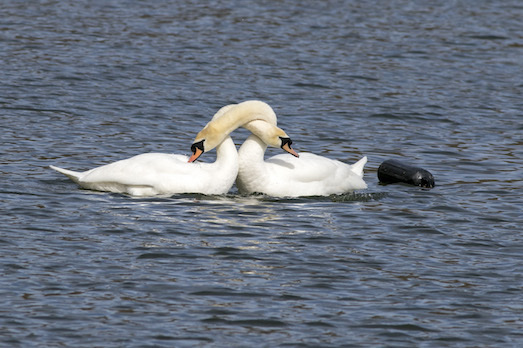 Next is the actual mating, (where a polite birder/photographer will turn away for a few minutes to allow for privacy), followed by the final part of the dance: the swans face each other and use their wings to lift most of their bodies out of the water. And thus, this ballet on water, is complete. If you ever get a chance to see this dance, stop for a few moments to appreciate the uniqueness of what you are watching. Vicky took so many pictures that her camera’s battery died! As always, however, keep your distance and don’t interfere! Enjoy the warmer weather and make sure you look for our water friends.